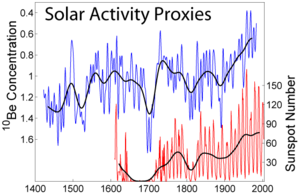 Graph showing proxies of solar activity, including changes in sunspot number and cosmogenic isotope production. Solar wind and magnetic field create en:heliosphere around solar system. The study of [sun spot] cycles was generally popular through the first half of the century. Governments had collected a lot of weather data to play with and inevitably people found correlations between sun spot cycles and select weather patterns. If rainfall in England didn't fit the cycle, maybe storminess in New England would. Respected scientists and enthusiastic amateurs insisted they had found patterns reliable enough to make predictions. Sooner or later though every prediction failed. An example was a highly credible forecast of a dry spell in Africa during the sunspot minimum of the early 1930s. When the period turned out to be wet, a meteorologist later recalled "the subject of sunspots and weather relationships fell into dispute, especially among British meteorologists who witnessed the discomfiture of some of their most respected superiors." Even in the 1960s he said, "For a young [climate] researcher to entertain any statement of sun-weather relationships was to brand oneself a crank. ^ Foukal, Peter; et al. (2006). “Variations in solar luminosity and their effect on the Earth's climate”. Nature 443 (7108): 161-166. doi:10.1038/nature05072. ^ Arctowski, Henryk (1940). “On Solar Faculae and Solar Constant Variations” (PDF). PNAS 26 (6): 406-411. http://www.pnas.org/cgi/reprint/26/6/406.pdf. ^ H.C. Fritts, 1976, Tree Rings and Climate, London: Academic Press. ^ Wilson, Mordvinov (2003) Archived 2009年2月27日, at the Wayback Machine. ^ a b c Damon, Paul E.; Paul Laut (28 September 2004). “Pattern of Strange Errors Plagues Solar Activity and Terrestrial Climate Data” (PDF). Eos 85 (39): 370–374. doi:10.1029/2004EO390005. http://stephenschneider.stanford.edu/Publications/PDF_Papers/DamonLaut2004.pdf 2005年10月5日閲覧。. ^ E. Palle, C.J. Butler, K. O'Brien (2004). “The possible connection between ionization in the atmosphere by cosmic rays and low level clouds” (PDF). Journal of Atmospheric and Solar-Terrestrial Physics 66 (18): 1779-1720. doi:10.1016/j.jastp.2004.07.041. http://www.arm.ac.uk/preprints/433.pdf 2007年4月15日閲覧。. ^ Lockwood, Mike; Claus Frohlich. “Recent oppositely directed trends in solar climate forcings and the global mean surface air temperature” (PDF). Proceedings of the Royal Society A 463: 2447. doi:10.1098/rspa.2007.1880. オリジナルの2007年9月26日時点によるアーカイブ。. https://web.archive.org/web/20070926023811/http://www.pubs.royalsoc.ac.uk/media/proceedings_a/rspa20071880.pdf 2007年7月21日閲覧. "Our results show that the observed rapid rise in global mean temperatures seen after 1985 cannot be ascribed to solar variability, whichever of the mechanisms is invoked and no matter how much the solar variation is amplified." ^ Stott, Peter A.; et al. (2000). 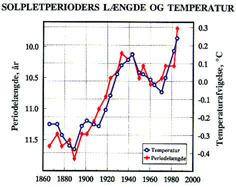 “External Control of 20th Century Temperature by Natural and Anthropogenic Forcings”. Science 290: 2133–2137. doi:10.1126/science.290.5499.2133. PMID 11118145. Abbot, C. G. (1966). “Solar Variation, A Weather Element” (PDF). PNAS 56 (6): 1627-1634. doi:10.1073/pnas.56.6.1627. http://www.pnas.org/cgi/reprint/56/6/1627.pdf. White, Warren B.; Lean, Judith; Cayan, Daniel R.; Dettinger, Michael D. (1997). “Response of global upper ocean temperature to changing solar irradiance”. en:Journal of Geophysical Research 102 (C2): 3255-3266. doi:10.1029/96JC03549. http://www.agu.org/pubs/crossref/1997/96JC03549.shtml. Foukal, Peter; et al. (1977). “The effects of sunspots and faculae on the solar constant”. Astrophysical Journal 215: 952. doi:10.1086/155431. Dziembowski, W.A. ; P.R. Goode, and J. Schou (2001). “Does the sun shrink with increasing magnetic activity?”. Astrophysical Journal 553: 897-904. doi:10.1086/320976.